Copyright: Copyright in all images submitted for this competition remains with the respective entrants. Each entrant grants a worldwide, irrevocable, perpetual licence to Airxcite Ltd t/a Virgin Balloon Flights to feature any or all of the submitted images in the Love Our Landscape charity calendar 2014 and any promotional material both online and offline connected to this competition and the calendar. 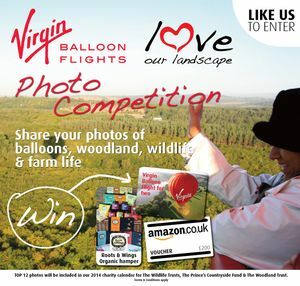 We want to inspire you to capture what makes our countryside so amazing, whether that’s woodland, wildlife, farm life; from a Virgin balloon, of a balloon or at ground level. Share the love! The two grand prize winners shall each win an Amazon voucher with a face value of £200, two Virgin Balloon Flights National 7 Day Anytime Flight Vouchers and a Roots & Wings Organic hamper. Maximum of four entries per person. Your images must have been taking in England, Scotland and Wales in the last 12 months and must not have been overly altered or enhanced digitally. Entries will be judged based on their originality, composition, whether they capture the character of the British landscape/countryside and tell a story, commercial appeal and the suitability to appear in the calendar. ditions.3. Entries should be submitted via the online ‘app’ or application which can be accessed through www.facebook.com/virginballoonflights by clicking the tab marker ‘WIN’.